The fiercely wild bobcat named Gallagher might not know it, but she has a lot to be thankful for. The roughly one-year-old animal was brought into the B.C. Wildlife Park in Kamloops last week after being rescued from the side of the road by a Good Samaritan near the Gallagher Lakes area. 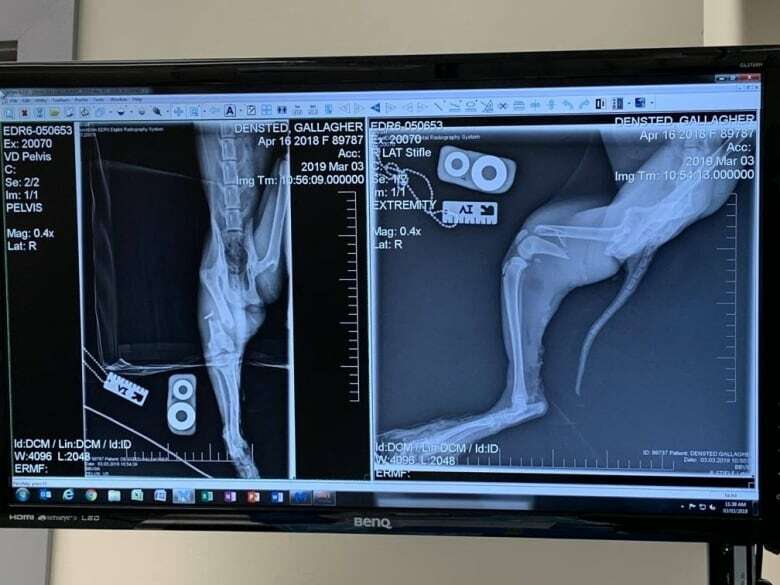 "She had likely been hit by a car and had a really large laceration on her back leg," said Dr. Ellen Denstedt, a veterinarian at the park. 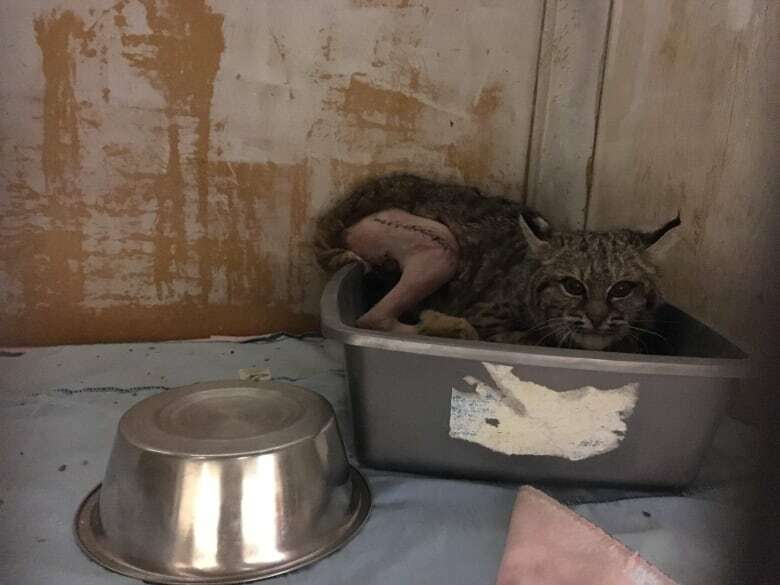 "The person that found her was really brave and actually brought the bobcat into her car for safety." It was a brave, bold move considering how feisty the little bobcat is — she's about the size of a house cat but it takes three people to hold her still. 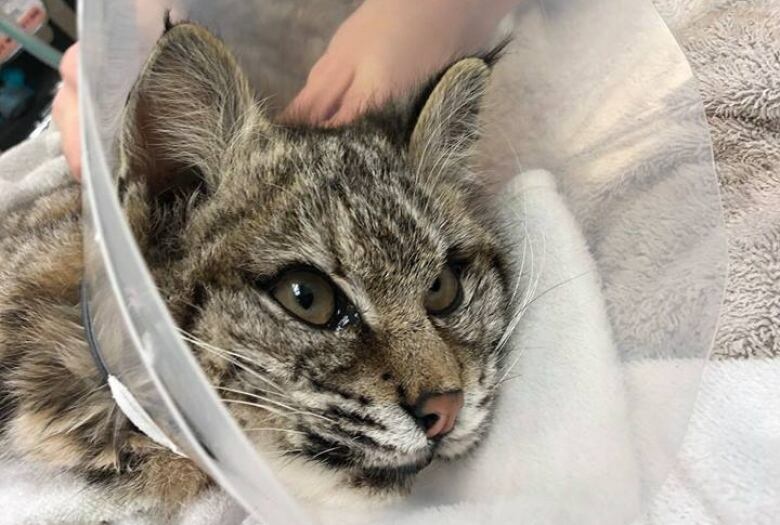 The rescuer called conservation officers, who took the bobcat to the animal hospital. 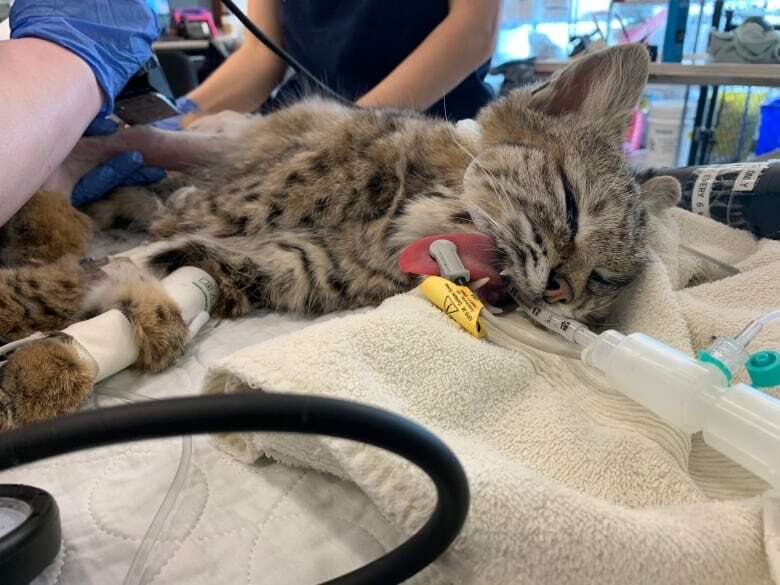 The surgery was done at Boundary Bay Veterinary Specialty Hospital in Langley, and now Gallagher is recovering at the wildlife park. "She's very ferocious and angry with us. It's essentially like having the most angry house cat," Denstedt told CBC's Jenifer Norwell. But those traits are a good sign: it means the animal has a lower chance of being habituated to humans and can instead be released back into the wild. "She's a young animal, and so the potential is there [to be habituated], although it's very low," Denstedt said. "She doesn't like us, so that's a perfect candidate for a release." It will be several more weeks until Gallagher is fully healed and able to fend for herself. Her injuries were quite severe and included a badly broken leg; the two pieces of her femur were at a 90-degree angle from each other. A plate was put in to help heal the fracture but will be taken out before she's released. "It's actually really important to make sure that we remove the plate, because if she were to be eaten by another animal out in the wild and they were to ingest that plate, that could pose some problems for them," Denstedt said. "There's also the risk of having that hardware in there down the line becoming infected." Denstedt estimated it will be about six weeks for the animal to recover from the fracture. "I don't want to say that I am attached to her, but I am very much invested," Denstedt said. "My dream job is to help our wild animals because I feel like they're the ones that need it most."